With built-in actionable intelligence see how Virtualization Manager 7.0 and help you fix active issues and prevent future ones from ever happening. Recommendations help optimize VM CPU and memory size, VM host placement, host utilization, and more. Optimize your virtual infrastructure with SolarWinds® Virtualization Manager. Actionable intelligence helps you fix and prevent performance issues. 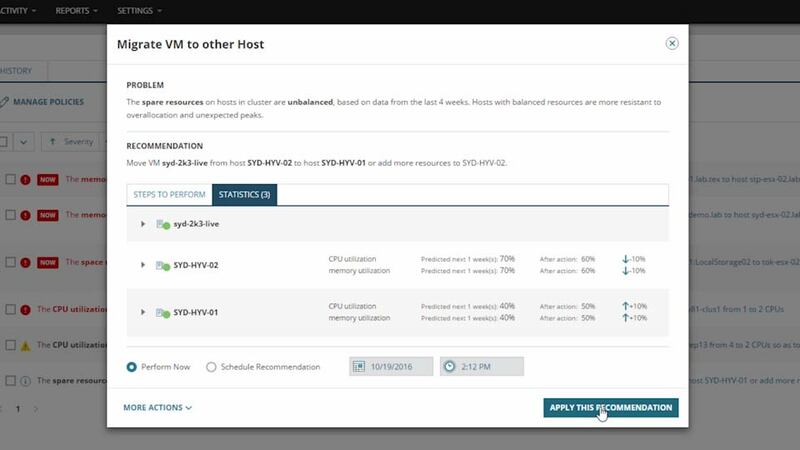 Virtualization Manager analyzes active and historical performance trends and patterns to calculate recommendations for your unique environment. Easily sort and organize recommendations by cluster/host, type, severity, and strategy. Open a recommendation to see more detail and perform the fix right now, or schedule it to run at a later date and time. Prevent future performance and sprawl contention by proactively implementing resource or configuration changes using Virtualization Manager's predictive recommendations. Unlike traditional balancing software, historical pattern data, as well as current performance data, are utilized to help prevent unnecessary VM movement and resource availability when predicted usage spikes occur. Start optimizing and managing your virtual environment with recommendations from SolarWinds Virtualization Manager.